Continued from Stage 28 - page 1. At the T-junction take the left turn and cross the Río Oríbio and walk down the main road for 3 kilometres to the village of San Cristobo do Real. Go through the village passing the church and again crossing the Río Oríbio by the lavadero. Pass the cemetery and take the lane and keep on walking down it until you get to a junction where 4 tracks meet. Keep walking straight on and then cross the Río Oríbio once again. Here you start walking uphill and pass a church and its adjoining cemetery into the village of Reche (café/bar). Take the minor tarmacked road and over the Río Oaga, crossing another bridge and walk along a track until you enter the village of Tredezín. Walk through the village and walk down a path running parallel to the river. As before, the path begins to climb and at a T-junction take a left, cross the bridge over the Río Oríbio once more and walk into the village of San Martíno. Pass through the village and up a hill where you cross a minor road and down a path which links up with the main road to Sarria. Here take a left and then down a lane sign posted Friexo 4 and before the bridge turn right down a lane into Samos. 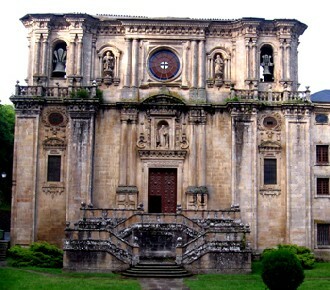 In Samos you will find the impressive Benedictine Monasterio de San Julián de Samos. It was founded in the 6th century by San Martin Dumiense and renovated by San Fructuoso in the 7th century. Unfortunately soon after the monastery was renovated it was abandoned because of the Moorish invasion and it wasn't until the Asturian King Fruela I reconquered the area did the monks return. Some years later King Fruela was assassinated and the monks gave refuge to the King's wife and son, who was later to become Alfonso II of Asturias. Because of this the monastery was granted royal protection. Over its history the monastery has changed hands many times. Early in the 10th century the monks were expelled by the Bishop of Lugo, Don Ero, because he wanted control of the monastery himself. Later that same century it was reoccupied by the Benedictines under the direction of King Ordoño II de León and in the 12th century the monastery was taken over by the Cluny order. Unfortunately in 1558 there was a massive fire which destroyed much of the monastery. It was rebuilt but the monks were again expelled in 1835, however the Benedictine monks returned in 1880. In the 19th century, during the wars with Napoleon it was used as a military hospital. In 1951 the monastery yet again caught fire which destroyed its famous library and causing it to be reconstructed once more. The monastery's church was built between 1734 and 1748 and contains a library measuring 31 metres in length and contains more than 25,000 books. The monastery has 2 cloisters. The larger one called unsurprisingly Claustro Grande was built in the 17th century and at 3,000 m2 it is considered to be the largest in Spain. It contains a statue to Padre Feijóo (Benito Jerónimo Feijóo y Montenegro) a Spanish friar and scholar who did much to demystify myths and superstitions. The other smaller cloister, Claustro Pequeño built in the 16th century is also known as the Claustro de las Nereidas because of the strange serpentine fountain in the middle. The figures have serpentine bodies but the head and chest of a woman. There's a strange tale that surrounds this 18th century fountain. 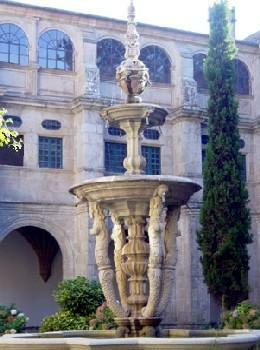 It is said that the ecclesiastical authority at the monastery didn't think it was an appropriate location for this type of fountain and they ordered it to be dismantled and transported to a more discreet location. The day came for the fountain to be moved and everything was ready but as the men tried to lift the fountain it appeared to increase in weight dramatically, so much so that no matter what they tried they just could not move it. There was no option but to leave the fountain where it was and rebuilt it in its original location. Miraculously they were able to move the stones once more because they had gone back to their normal weight. Clearly the fountain had no intention of moving from that spot. If you wish to look around the monastery they do offer guided tours but you will need to check the times when these occur at the Porteria. The monastery also has an albergue for the weary pilgrim. In Samos village itself there are 2 other albergues and a number of restaurants offer a pilgrim menu. There are other shops including bakeries and banks.